Interview with Bishop-elect Neil Tiedemann C.P. 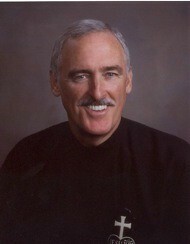 This interview has been posted on YouTube by Father Victor Hoagland C.P. I found this at Argent by the Tiber‘s site. There’s many ways that you can learn – and you’re up for any of them. You can help people communicate together and work with each other’s strengths. You don’t work well with people who are competitive or adversarial. You prefer to work toward a common goal… not toward conflicting goals. VATICAN CITY, 20 MAY 2008 (VIS) – The Holy Father appointed Fr Neil Tiedemann C.P., provincial consultor of the Passionists, as bishop of Mandeville (area 3,282, population 582,000, Catholics 8,800, priests 43, religious 34), Jamaica. The bishop-elect was born in New York in 1948 and ordained a priest in 1975. Today it was announced on the Vatican Information Service that Father Neil Tiedemann has been appointed Bishop of Mandeville, Jamaica; the first bishop of this diocese was, of course, the late Bishop Paul Michael Boyle C.P. Father Neil worked for some years in Honduras, as well as in Union City, in Brooklyn and in the other Jamaica (Queens, New York). You can read a fuller account of his previous postings at A Penitent Blogger. Berenike asked this question two months ago and I promised her that I would give an answer. She has surfaced the question again with a link to her original post on vocation as the context for the question. To try to arrive at an answer, let’s begin by looking at the specific case of Saint Gemma, rather than vocations in general (-we can do that later). The following quotations show how the question of a Passionist vocation was played out in Saint Gemma’s life. This is a necessary preamble because the lives of the saints, like our own, do not always follow the outline laid down in the manuals, even if we try to do that with them. Then having related how Our Lord in vision showed her her New Director, she goes on to give him [Father Germano] a minute account of what had happened to her during the previous two years: of her serious illness and miraculous recovery, of Blessed Gabriel [of Our Lady of Sorrows], of her vocation to the Religious State and of her first acquaintance with the Passionists. In this letter, Gemma explains how she had decided to enter the Order of the Visitation, in gratitude for having been cured through the intercession of Saint Margaret Mary Alacoque. (During her illness, she had read a life of Saint Gabriel, who had appeared to her after the book had been taken back by the person who had lent it to her.) Her confessor and her family were happy with her desire to become a religious. She made a retreat at the monastery of the Visitation, after which everything was arranged for her to return there for ever. As the time drew near, she heard these words internally many times: You will never be a Salesian [i.e. Visitation Sister]; another more penitential life is being prepared for you. It was at this time that the Passionists came to Lucca to give a mission. Saint Gabriel told her to go to the Passionist, Father Gaetano, for confession and to tell him everything: Tell him that you want to be a nun, but that you want a more austere rule. Father Gaetano told her: But there are also Passionist Nuns. In the same letter to Father Germano, Gemma writes: From that moment, my thought was fixed on those words, and my wish was to become a Passionist. I told this to [my] Confessor and he was happy with it, and in fact he said to me that for me a more rigorous rule than that of the Visitation was needed; then after that, together with the vocation I received a great devotion to Confrater [Saint] Gabriel; I began praying to him, and I still do, that God give me the grace to become a Passionist [Nun] soon. Finally God made known to her that the requisite conditions would not be fulfilled and that she had to be resigned. “What I have gone through this morning,” these are her words, “I cannot explain. I shall only say that I felt a great impulse to cry. I ran away to my room to be more free there and alone, and I cried a great deal. At last I exclaimed: Fiat voluntas tua!” But those tears were not of grief; they were of perfect resignation. The fiat was spoken [continues Father Germano]; Gemma thought no more of being a Religious; she ceased to speak of it, and occupied herself solely in preparing for death, which came, as she had foretold, in six months. God was satisfied with his faithful servant’s desire and with the merit of the sacrifice she had so generously made. 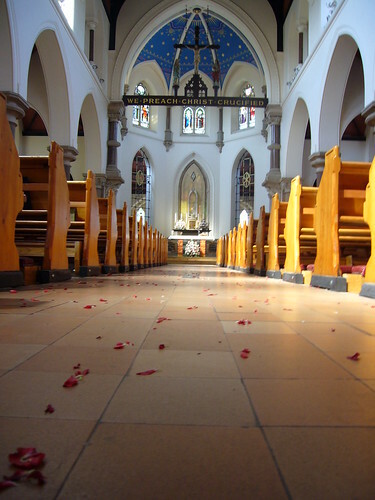 She had already as an act of private devotion made the vows of Religious Profession. She was a Religious and Passionist in mind and spirit and bore the stigmata of His Passion on her body. She was then fit to leave this world, well satisfied and full of joy at having perfectly attained the end for which God placed her in it. Yesterday the Congress of the Bavarian/Austrian Vice-Province of the Five Wounds (shown above) elected their Provincial and Consultors. Father Gregor Lenzen was elected Provincial for the fifth consecutive term, responding to the General’s request if he would accept office, with the classic words: Accipio in crucem. His consultors are Father Michael Hösl and Father Lukas Temme. If he lives until the next Congress (=Chapter in a Vice-Province), Father Gregor will have been Provincial for twenty years, which is not bad for a forty-nine year-old. His predecessor, Father Martin Bialas, was also Provincial for five terms but, as the term of office was three years in those days, Father Gregor is already one year ahead. Dare I say Ad multos annos? 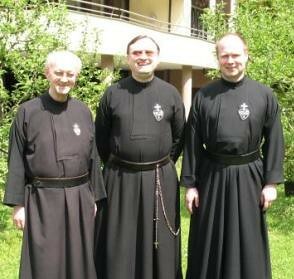 Here is the new Council (left to right: Father Michael, Father Gregor, Father Lucas). 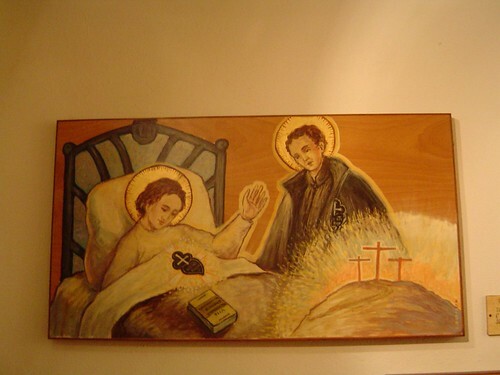 Father Gary at The Passionist Charism has posted a number of useful and interesting items for Saint Gemma’s Feast tomorrow, including the Mass of Saint Gemma Galgani .